We proudly claim that our fan group support every biathlete from all over the world: after Canada, Estonia and USA let's move to Switzerland for another exclusive interview! With the recommendation of Scott Gow we ask another rising star, who also reached her first World Cup points in this season; the middle one of the three Swiss sisters: Elisa Gasparin! haha! And in the women's relay we were really happy, we didn't have many relays for switzerland, and its always special to race with two sisters! and we did a really good race, if you calculate our ages, i think. You did a fantastic pursuit in Oslo: from the 48th to the 20th place. How did you performance so well in the terribly windy race? I am a good shooter and when it starts to be difficult at the range, everyone gets nervous and then i know i can attack! i like shooting with wind, i can still be easy in my head and focus, while others starts to tremble. But i was also little lucky with the wind, but you still have to hit the targets! I just want to race often in the points, and to get into a mass start once would be amazing! And for sure i want to qualify for Olympic games! The Swiss biathlon becomes stronger and stronger: Benjamin with podium finishes, Selina several top 10 results, and there are more and more young talents like Aita, Patricia and you. When do you think an individual victory or a relay podium possible? An individual victory is possible in every race! We can be stronger as the other athletes, but we also need a little portion of luck, we have to see that. The level at the WC is so high and everything is so closed. But i believe in a Swiss Victory next year! And for the relay it will take time. But who knows, maybe at the next olympic games? We would like to thank you the photo together with you three and your bib from the individual race in Nove Mesto. 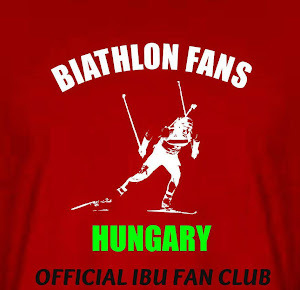 Do you have good memories from the Hungarian biathlon fans? Haha sure! Good cheering in the curve before the shooting range, thanks a lot!